I always tell the story at my parties of how long my first kitchen cloth lasted before I needed to wash it. I got two kitchen cloths in the host gifts from my first party (this is before I had joined Norwex myself). I knew that with the silver in them, they would “self-sanitise” as long as they were thoroughly rinsed, and would therefore go much longer between washes than an ordinary cloth. You know the way your average kitchen cloth or sponge gest slimey and smelly in about a day? Yeah, that doesn’t happen with Norwex cloths, as long as you treat them right 🙂 The smell is the bacteria growing in your cloth! So one day, about three or four weeks after I first got them, I noticed my current cloth *was* starting to smell a bit, so I chucked it in the wash, and went looking for the other one. But I couldn’t find it. Now, I have three kids, which equals, lots of washing. So I figured it must be somewhere in one of the piles of clean or dirty washing that seemed to multiple in my house. But no luck. Where did I eventually find it? In the Norwex bag I had received it in. That’s right, I had managed to use the same cloth for almost a month without it needing to be washed! Now, to be fair, I must have been fanatical about rinsing it back then, because now I usually find they need to go in the wash about once a week. But occasionally I get a customer who says her cloth starts to smell after only a day or two, so what’s going on? Simple: smelly cloth means a build up of organic matter within the cloth. So although she may think it’s getting thoroughly rinsed each time, perhaps it’s not. Rinse the cloth when I use it. Rinse the cloth when I find it all milky and weetbixy on the dining room table. At the end of the day, I rinse it thoroughly, and sometimes even pour some boiling water over it (if I’m making a cup of tea), wring it out, and hang it up to dry. Others sometimes lay it flat to dry overnight which seems to work too. If your cloth is smelly, can you boil it? But my cloth is still smelly, what’s wrong? Some customers with children or partners who perhaps don’t rinse it properly find their cloth goes smelly more quickly. That’s why I do a thorough rinse every night using hot water (you’d be surprised how much more grime hot water will flush out, because of the way it opens up the fibres). I know another consultant with four kids, who just rotates her cloths more often, knowing her kids aren’t rinsing effectively. It’s also important to allow the cloth to dry – the silver goes to work to kill any remaining bacteria as your cloth dries. It’s not instant. It could be your washing powder. Most commercial washing powders have a high filler content, which can coat your clothes and cloths. This will stop it from cleaning as well, and ironically also stops the washing powder from cleaning it! Fabric softener will do this too. I recommend you try the Norwex washing powder, which is generally more cost effective than supermarket brands anyway. And FABULOUS for anyone with sensitive skin. Are you using it to wash your dishes or “rinsing” in water with dishwashing liquid in it? This can actually coat the silver and prevent it from doing it’s job! Make sure any dishwashing liquid or soap is thoroughly rinsed out. 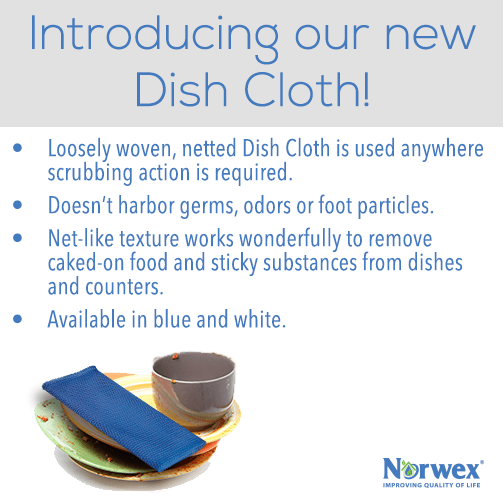 You might also like to try the netted Norwex dish cloth instead of the kitchen cloth. It’s not available yet in Australia I’m afraid, but it is in the US. I’m not sure about other markets. However, I have one I got as a consultant incentive last year, and it’s AWESOME. And doesn’t absorb anything, so a much better choice for doing the dishes. If you have already got that build up in your cloths, try soaking them with some Norwex Washing Powder, or some Odour Eliminator (which is enzyme cleaner which eats organic matter – fabulous on the grout in toilet floors too), before washing next time. Of course, you can also give them the “spa treatment” mentioned above (boiling with some Norwex laundry powder), and if they have a large build up, you may even need to do it a few times before the water runs clear. But we have water restrictions, I don’t feel like I can rinse it so much! In general, cleaning with Norwex cloths will SAVE you water. You don’t need to rinse off cleaning sprays, and you don’t need a lot of water in the cloth to clean. You can wash your whole car with the norwex car wash mitt and half a bucket of water! BUT, rinsing the kitchen cloths effectively, especially if you have kids using them all day, may seem like things are the other way around. So if you are in a water-poor area, you might want to actually have a few more kitchen cloths and rotate them more frequently – just throw them all in the wash at the end of the week or whenever you are doing a load. Also, if you can get hold of them, try getting a few of the netted Norwex dishcloths (not yet available in Australia). They don’t absorb liquid, and therefore don’t take as much water to rinse, generally. And just remember, if you were using chux and just chucking them instead, you would be using a LOT more water and resources in the manufacturing process than you use to wash your cloths. NB If you have smells building up in your body cloth it is the same issue – organic matter building up (although in this case it’s dead skin cells rather than food). Make sure you are *thoroughly* rinsing it after use and allowing it to dry. Some people do seem to need to wash them more often than others (this is true within my family), which may be just simply down to your skin type. Another question I often get asked is about the difference between the kitchen cloth, all-purpose kitchen cloth, and enviro cloth. I answer that here. I have been RELIGIOUSLY rinsing my most recent Envirocloth this week, wringing it, and hanging it to dry. We wash the Norwex cloths only in Norwex laundry powder. And it still has gotten exceptionally smelly (like, mildewy smell you can smell from across the room when someone wipes something with it). Someone on another blog mentioned something I’d not considered — hard water. Our water is really, REALLY hard and now I’m wondering if maybe mineral buildup on the cloths is acting much like soap or grime buildup would. Just another possibility to consider if you have customers who are baffled by how fast their cloths are getting gross. Thanks for that, I hadn’t thought of that as being an issue, but it makes sense. Have you tried using the magnet ball in your washing machine (this is only an option in top loaders as it could crack the screen on front loaders)? It prevents the minerals in the water from binding with the detergent molecules to create that soap scum effect. And have you tried boiling for a few minutes with some norwex washing powder? Citric acid – and to a lesser extent vinegar – can also help with hard water, so I’m wondering about soaking them in vinegar or something and seeing if that helps?